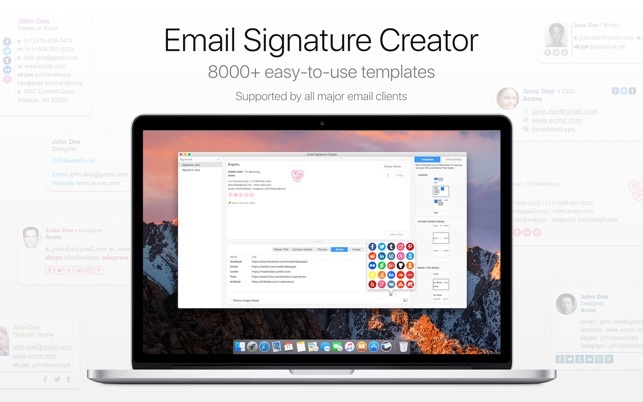 Quickly and Easily create your Email Signature, with 8000+ easy-to-use templates ready for you. 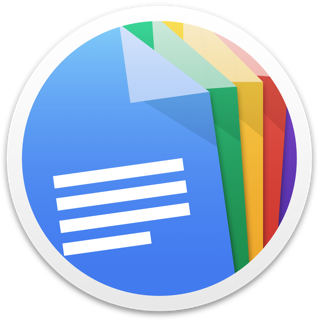 Compatible with all the major email clients: Mail, Outlook, Gmail, Inbox, Yahoo, Spark, Polymail…! No Coding skills needed. No HTML Expert needed. Just select among our 8000+ templates, easily accessible. 28 unique layouts, 30 unique contact details styles, 20 unique name/title style, let’s you choose easily among our 8000++ templates. • 50 Most Popular Social Icons available for your signature. 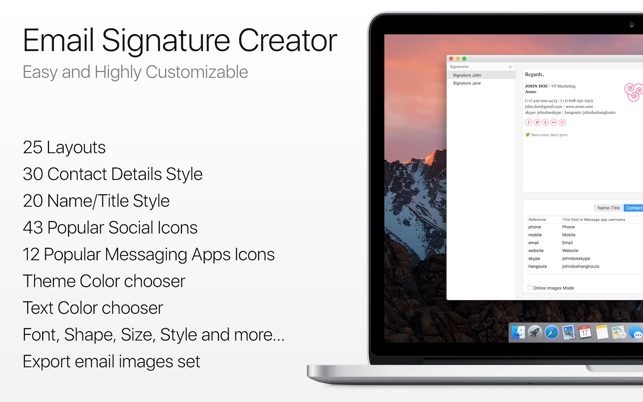 • 18 Most Popular Messages Apps Icons available for your signature. • Select shape, style, color, size and more for the icons. • Include your logo or picture easily. • Select Size and Shape. • Image Retina or not. • Export the images set of your email signature and easily upload them on your servers or a free cloud service. • Automatically save your Signatures. • Address links open Map on Google, Apple, OpenStreet, Yahoo or Bing. You choose. For email clients steps to paste the signature while respecting format, colors and images visit: madbirdies.com/esc/ (especially for Apple Mail and Outlook 2016). We've worked hard to make Email Signature Creator as simple and efficient as possible for you to use. We would love to hear your thoughts via email and make any improvements to future versions of this app. We usually answer within 24h. If you're enjoying Email Signature Creator, we'd appreciate it if you took the time to leave us a review, thanks! This is a small update to mainly fix few UI glitches in Mojave and for Dark Mode support. Added settings for left/right padding for layouts with a vertical separator. Now the fields in the tables are accessed with only one click. The address field now grows automatically when the address is over multilines. As many of you are using ESC to create email signatures for friends and colleagues, a new free ESC Companion is now available for them on our website to ease the Outlook and Thunderbird process. The Share public web links now have, when open on iOS, an extra button to copy to iOS Outlook. This is a small update before the bigger one coming soon. If you need us you can find us at @madbirdiesapps on Twitter, at facebook.com/madbirdiesapps, or contact@madbirdies.com, we love hearing from you! Signatur lässt sich nicht in E-Mails einbinden. Funktionsumfang ist sehr gering. At first I was a bit unimpressed, but as you circle through the many different design options, you really get impressed. 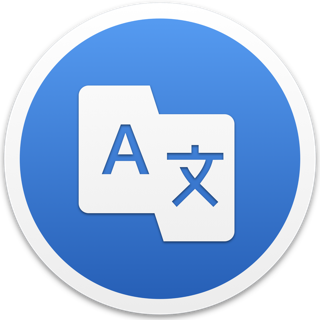 The developer has tried to make it really easy, the manual is comprehensive, but could be a bit more explicit regarding the exporting and automatic renaming of images. 5 stars for this excellent piece of work, the 6th star would be for being able to change apply different background colors to different areas of each signature. I like this app from the first moment. The online-picture mode is a little tricky. But in summary this app is worth any €.